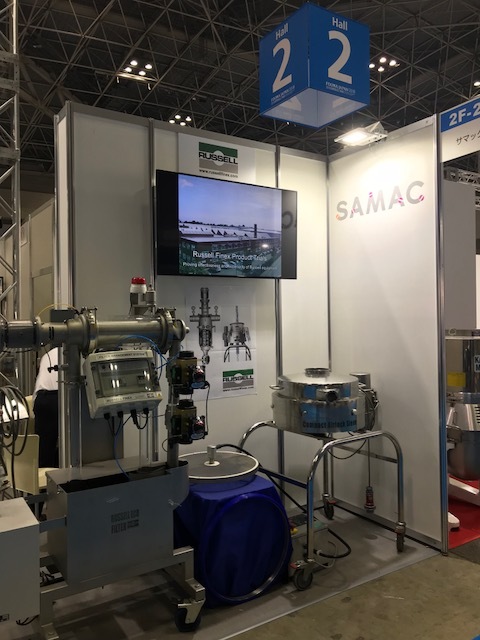 Fooma Japan is a progressive exhibition in the food industry, focused on the innovations and development of machinery and technology in the food processing industry. The action-packed four-day exhibition held at the Tokyo Big Sight took place from 12th – 15th June 2018, and facilitated the collaboration of professionals within the food processing industry. 2018 proved to be another successful year for Russell Finex at Fooma Japan, with a high quality of enquiries and connections being made. The company presented a selection of innovative sieving and filtration equipment for the food industry. The Russell Compact Airlock Sieve™ was one of the machines displayed. This user-friendly vibratory sifter removes oversized contamination from food powders. Its unique TLI (twist, lock and inflate) airlock clamping system creates an airtight environment, protecting operators from harmful dust or product leakage, whilst ensuring a contamination-free product. The Self-Cleaning Russell Eco Filter® was also showcased at Fooma 2018. This self-cleaning filter has been specifically designed for the sanitary requirements of the food industry, with the ability to remove oversized particles or contamination. Its unique design ensures there are no stoppages or additional costs for changing of filter elements. Contact us to discover more about the innovative range of sieving and filtration solutions available to improve your food processing line.